It only took Nintendo a few hours (a pretty rapid turnaround) to resolve the issue with Legend of Zelda game discounts; you can now pick up any and all series titles on Wii U and 3DS with a 30% discount. Hat tip to Benson for the heads up. 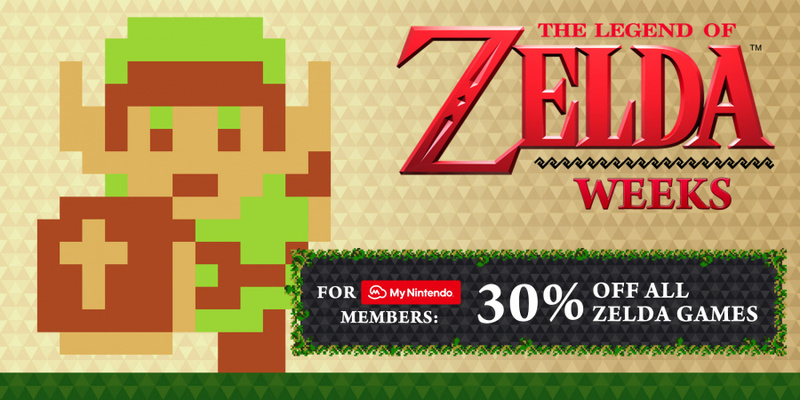 Thankfully, it seems the originally intention of this promotion (as most interpreted it) is to allow multiple discounts on the full range of Legend of Zelda games. Nintendo of Europe has shared a tweet acknowledging a problem, with a fix planned. Nintendo UK has also confirmed that the fix outlined in that tweet is in relation to the single purchase limit, confirming that this is an error. Just recently we shared the pleasing news of a range of discounts on The Legend of Zelda franchise games on the Wii U and 3DS eShop, covering every game released on the systems. The deals are available for My Nintendo members, but now that they're live a disappointing limitation has emerged. When you look at the eShop (with your account linked to the Nintendo Account / My Nintendo) all the games are shown with a discount, but when you go to make a purchase it prompts you to redeem a voucher. It states that it's limited to one use, and sure enough after we completed a purchase with 30% off - The Legend of Zelda: Oracle of Ages, if you're curious - the games all reverted to full price. We've re-read the official page a few times and this isn't at all clear, so naturally there's some disappointment among those caught out that were hoping to buy multiple games at a discount. We've asked Nintendo for comment and will update this article should we receive a reply. When it comes to grabbing a discount, then, choose carefully. I just copped that. After I purchased the last outstanding bit of Hyrule Warriors DLC I was missing. As if the "sale" wasn't bad enough. Luckily for me I don't think there's anything else I want to buy, well not at their current prices. They should be offering 50% off especially on the older games. It didn't say this on the eShop. It was only afterwards I seen it on the My Nintendo website. Edit: I just rechecked the eShop and it does say that it can only be used once. I missed that as I gloss over most of the t&c's. Also, the discount prices are still valid for me. Perhaps because I didn't buy a game but DLC within a game. Anyway, it's really stingy of Nintendo to restrict it to just 1 game. It's like trying to get blood from a stone with them when it comes to bargains. This is the same company that want to charge us for online on the Switch. Add that to the Japanese pre order website that crashed earlier in the week. I used mine on skyward sword finally gona try it out! Seems slightly unfair for people who have multiple accounts on a system. Wow. Okay, I admit it, this is pretty poor practice from Nintendo. While 30% off anything is usually a good deal, it's the vendor's responsibility to let potential customers know if an offer is a one-time-only deal. If a high street store did this they'd be forced to rectify it (proper signage etc.) within hours. Just need to double check which ones I already own before I make my choice, but I think it's most likely going to be TriForce Heroes. I'm mad for two reasons. 1. America doesn't have this deal and 2. They really couldn't be asked to put every Zelda game at 30% off? The latest main Zelda came out like 5 years ago. Nintendo once again forgets they're made of money and can bother to lose what's equivalent to a penny to them to give their customers a great deal. What a ridiculous idea, these sales are exclusive enough. Let the consumer decide how much to buy and empower them to go farther with their dollars. Must be a mistake/error on Nintendo's awesome Just For You Offers promo. I hope they fix it soon since I want to double dip on ALttP, Zelda II and OoT3D. Remember how a lot people said they already had most of the Zelda games they wanted and might buy 1-2 discounted titles at most? Well, Nintendo heard ya! "Hey we can sell more games if they're set at a lower price"
"But customers will buy MORE games if we offer discounts over all sales"
"How about we keep the gamepad map for the Wii U breath of the Wild and use HD Rumble for the Switch, our fans will probably buy both"
Nintendo never ceases to amaze me, sadly not in a good way most of the times. This is typical of Nintendo. They just hate discounting their software even on a dead console. I think their advertising is deliberately misleading. They're either clueless or really like annoying their fans. Nintendo always manage to screw over their loyal fanbase. Are they purposefully trolling? I mean, even 30% off isn't great compared to the recent PSN sales, so why limit it? It's an error Nintendo is going to fix. Things like this push people away from Nintendo and into the arms of piracy. Loosen the purse strings a notch Ninty. Nintendo is officially more stingy than Scrooge McDuck. Good thing I already got all Zelda games that I want (I think?). Or maybe now I could purchase Twilight Princess HD digitally... I don't know, I still don't like replaying that game. I'm torn, I don't know if I should bother with Hyrule Warriors Legends or save my eShop funds for the Switch... Besides, I didn't play much of the Wii U version anyway. Also, it's about £11 for Ocarina of Time... that's very tempting too, but I can't justify it as I've got the cartridge. How many copies of OoT do you have? I've only got £30 eShop credit and even if I were to spend it, maybe Hyrule Warriors Legends would be the better option, as I don't own that one... Eugh! First world problems. Hopefully the fix is sorted as I wanted to purchase the Hyrule Warriors DLC; although I started to wonder that maybe I should just buy HW legends cheaply somewhere to access some of the DLC via the code. Unfortunately it's currently a Prime Exclusive on Amazon. @SLIGEACH_EIRE "this is the same company that wants to charge us for online on the Switch"
Yikes good point. I really hope they don't follow a same pricing model as Sony and Xbox because it doesn't seem like they're gonna offer even a fraction of the value. At least there are new digital prizes I can redeem with Platinum points. The theme will probably be nice, the videos I'd be surprised if you couldn't just watch them on YouTube but whatever. CAN THE USA PLEASE GET THIS DISCOUNT!!!! Was really hoping this sale would transfer over to North America as well. The videos are in 3D though. Hopefully it'll get solved soon enough. I've been itching to buy all of the Hyrule DLCs at long last. If there's no solution, what with me being both broke and unemployed, my choice will automatically go from "maybe just Triforce Heroes, maybe a Hyrule Warriors double-dip" to "next time, Tecmo". Is this in North America as well or will I just have to twiddle my thumbs? @jimi the free games on PS4 do make it seem more worthwhile to me. I play most of them. But seriously, America. That other giant country located on the map? Can they have cool stuff? @jimi "really old" and "crappy indie" titles? Now it's all your opinion. I don't see Nintendo offering anything to compare. There's value in it for a lot of people who enjoy the games, thus opinion. you're quite right! Remember a comment sometime ago from an 'interview' with the Happy Mask Salesman? Didn't he hint at being in Breath of the Wild? @whoisbdub I'm not a fan of motion controls so I had to endure that but the game itself was great. Once I got into it I had trouble putting it down. I really enjoyed it. Hope they remaster that one in HD. Thank goodness its been fixed! I seriously couldn't believe how cheap Nintendo at first. I do wonder if this actually was a mistake though or they were just quick responding to the backlash online? @RupeeClock I "bought" all the My Nintendo Zelda videos just to use some platinum coins, and they're actually not bad, the main theme one in particular is really good, and while maybe you could find them elsewhere, the 3D effect is nice. @BensonUii Nintendo's problem: everyone believed this was intentional. That's how bad Nintendo has been doing. As I understood it the discount is still one use only, the issue they fixed is unrelated to that. Is that right? We must twiddle away. Nintendo hasn't yet heard about this new thing called The Internet where people know whats going on all over the world within minutes (seconds, even) of it happening. I can't get the discount to apply. I've just gotten my 3DS and created a Nintendo Network ID and linked it to my My Nintendo account, as well as turned on promotional messages from Nintendo. However, the discount doesn't show on any of the Zelda games. I've rebooted the system several times. Alright, so let me understand this. Nintendo had a glitch on the deal, and within a short amount of time, 13 of the first 20 comments here are negative against Nintendo. I honestly am not surprised. @gardevoir7 It's more like 3. "To get access to all deals, make sure that your Nintendo Network ID is linked with a Nintendo Account. If you do not yet qualify, simply link your Nintendo Network ID with your Nintendo Account**. If you don’t yet have a Nintendo Account, visit the Nintendo Account creation page and create one for free." edit: Ah, in this case it just took 4 hours to show up rather than the "3 hours at the longest" specified in the small print. This at all in North America? Why the hell can't they sell 4 Swords Adventures and Minish Cap in eShop? Or cart? I could go for a Hyrule Warriors DLC discount if we got it in the US. Hero pack all the way (currently don't have any of the DLC). I don't think that was discounted when we had a Zelda sale earlier. If it was, oh well- I missed it. No discount for me, I can only view the WiiU eshop from my computer internet browser! When does the sale end for us in the USA? I'm very thankful for this sale as I finally can afford to download Majora's Mask 3D since 30% off the regular price results in a very affordable price for me. I haven't play the game since the N64- days, and I didn't play it that much back then either, to be honest. I thought it was pretty hard and I lost interest in it as time went by. But over the years I have been longing over to give it another try. So I'm really looking forward to pay, download and playing the game. Thanks Nintendo! lol, good old Nintendo, bringing those deals! @HnD Minish Cap is part of the sale...? Well, on Wii U- you're probably out of luck if you're looking for a 3DS version. As for Four Swords Adventures, that is for Gamecube, so not on the eshop since that is not a supported platform. There is still hope for putting GCN on Switch though, even if the joycons don't have analog triggers (they could support the Gamecube adapter and controllers, for example) so maybe one day. Though we recently had a Zelda sale on some of the titles, so I don't know if we'll get this one. Hmmm, I'm in the US and the sale was not reflected for me. Tried adding Spirit Tracks to my cart and it rang up as the usual 9.99. Welp, enjoy having to be at home to play a portable game, I guess. I'm sorry, I can't help it, the 3DS was this close to being the perfect handheld if Nintendo released the GBA games for it. Yes, I'm an Ambassador and yes, I have Minish Cap on it, but it doesn't count. Everyone should get to play GBA games on 3DS. @AlexSora89 Hell, I was an Ambassador too, day one 3DS owner, space gray, remember that day I received it. I sold it after XL version was announced. Sure I regret. I would never guess Nintendo will remove GBA VC. Its just ... I do not know, nonsense. As for DSL, gba games looks to small on it for me. Picture is even smaller than on GBA screen. But anyway at present time I really enjoying playing Golden Sun on my DSL. Thanks for trying to help. The discounts are visible in my eShop now! I bought a Link to the past...would buy more if I knew anything about VC on Switch. AKA the way a Golden Sun is supposed to be played. I did download the last Hyrule warriors dlc, Wii u version. Still a pity about those missing maps, story and fairies. But I'll never finish it anyway, impossible. As for Twilight princess hd: Its a remaster I do not have yet, but I don't want to pay that much for a download. Sadly it won't hit the selects range (very unlikely), but I still hope I can find the retail version somewhere at a decent price sometime. We'll see. As for e-shop discounts: They will become very scarce. I think the last cool games (that are quite a bunch) I have to get someday, but at full price. I can't be helped.